As a part of Sweater Days, the Office of Sustainability is hosting a Sustain Your Community Supply Drive. 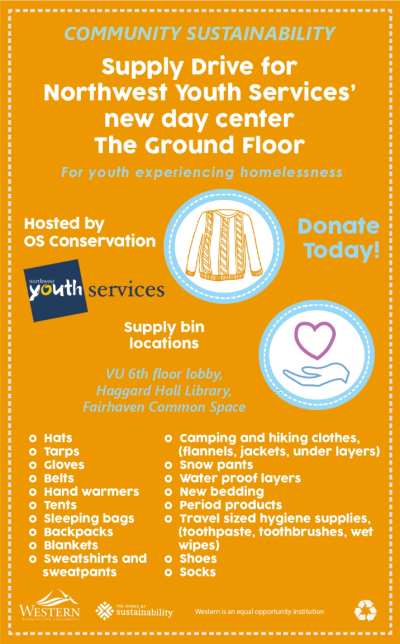 This event is a great way to support the Northwest Youth Services’ new day center for youth experiencing homelessness, The Ground Floor. Western students, staff, and faculty are invited to donate gently used or new items cold weather clothing. Supplies will be collected from Tuesday, Feb. 4 through Tuesday, Feb. 18. Bins will be located in the following locations: Viking Union 6th Floor Lobby, Fairhaven Commons, and Haggard Hall. You can also support this event by attending the Sustain Your Community Mend and Repair Workshop as we continue the Sweater Days campaign on Friday, Feb. 8 from 3-5:30 p.m. in Wilson Library 270. For more information, please contact Lauren at OSConservation@wwu.edu or (360) 650-4924.